The SCCF Prescribed Fire Program is directed by the Wildlife and Habitat Management Department. SCCF's prescribed fire crew and burn bosses are trained and certified in wildland firefighting by the Florida Forest Service (FFS). SCCF is a partner of a Sanibel Prescribed Fire Task Force consisting of partners from the City of Sanibel (COS), Florida Forrest Service (FFS), Sanibel Fire Department (SFD) and U.S. Fish and Wildlife Service (USFWS). Prescribed fires are conducted on Sanibel to assist land managers in preserving natural habitats on conservation lands. However, while conducting controlled burns, public safety and the protection of private property are the main concerns for burn managers (burn bosses). It takes months of preparation to get a parcel ready to be burned, as well as the public being notified with plenty of advanced warning. For the prescribed fire to actually happen on any given day the atmospheric conditions must fit a very narrow range for a permit from the Florida Forest Service to be issued. The issuance of a burn permit by FFS depends on several factors such as time of year, temperature, drought index, wind speed, wind direction, approximate time of a sea breeze wind shift, relative humidity, dispersion, lifting height, fire crew staffing, and vehicles and equipment available. Fuels, or dead vegetation that builds up in the habitat each year, accumulate each year on conservation lands. Historically, these fuels would be burned off every few years (sometimes sooner) by natural wildfires that were started by lightning strikes. These days, the frequency of fires has been severely depressed. Prescribed fire is the most practical, cost effective, and natural method to reduce fuel loads on natural lands. Without periodic controlled burns on these lands, wildfires can be very difficult to control because of the increased fuel loads. Many of Florida's natural areas are fire dependent. For these plant communities to thrive and remain healthy land managers try to mimic the natural fire cycle. Fire promotes growth of native plant species through nutrient cycling and increased seed production, while inhibiting invasive species. Remember, Sanibel Island is fire adapted. Fires are a natural component of the ecosystems of the island. Without controlled fire, most habitats succeed to tropical hammock or tropical hardwood forests. Historically, Sanibel Island was mostly an open grassland savannah with very few trees. Currently, most of our habitats have become forests with little light penetration on the ground and low groundcover diversity due to fire reduction. The primary management purpose of our controlled burns is to keep the dwindling open grassy areas (uplands and swales) free of invading native shrubs and hardwoods such as buttonwood (Conocarpus erectus), wax myrtle (Myrica cerifera), Carolina willow (Salix caroliniana), saltbush (Baccharis halimifolia) and cabbage palms (Sabal palmetto) which end of shading out the habitat. Vast numbers of native wildlife depend upon these open areas such as gopher tortoises (Gopherus polyphemus), wading birds (herons, egrets, etc. ), and the state threatened and endemic Sanibel Island rice rat (Oryzomys palustris sanibeli). 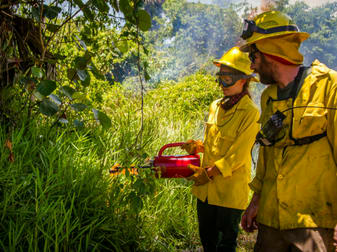 Fire opens up the overgrown ecosystems allowing for sunlight penetration while promoting new and healthy growth of new native vegetation for wildlife forage, as well as reducing exotic vegetation. Just a few short months after a controlled burn the habitat is back to a freshly renourished version of itself providing optimal resources for wildlife and providing a better aesthetic wildlife and ecosystem viewing experience for people.